Proceedings got underway on Wednesday 6th March for WOW Saddles sponsored rider, Richard Davison, as Myerscough College hosted it’s Premier League Show, with classes up to Grand Prix. Richard made his return to the scene following the sale of his prolific ride Hiscox Artemis to Swiss Under 25 rider Phinie von Bremen earlier this year and dazzled the judges with a plus-70% win in the Grand Prix with 12 year old Holstein gelding, Hiscox Aliano. This horse had already shown much promise at Small Tour under Richard’s wife, Gillian Davison, and now proves to be one to watch! Richard Davison gets back to normal after a hectic start to the year! 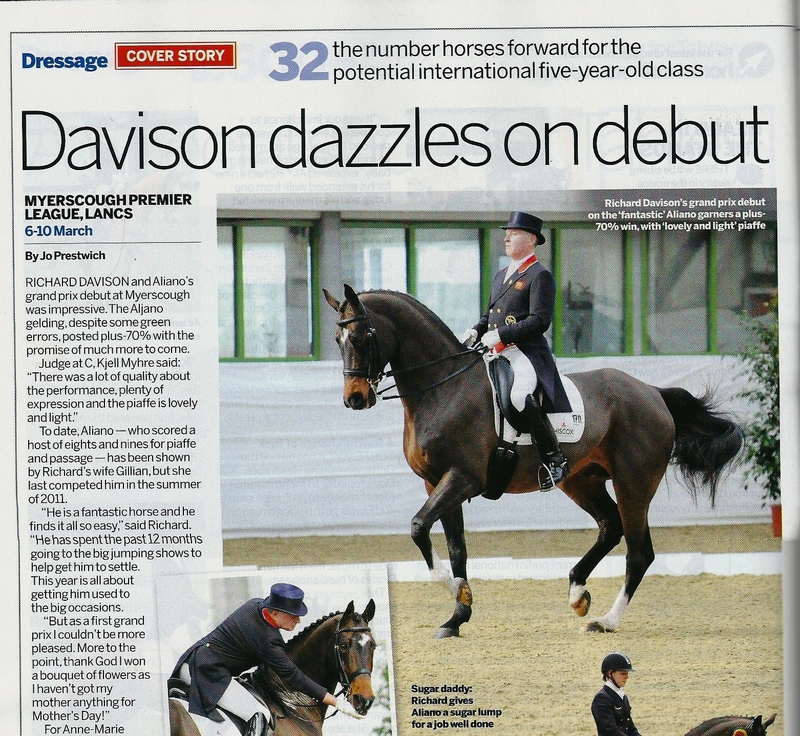 The recent edition of Horse magazine featured a wonderful interview with our sponsored rider Richard Davison. We have posted a few extracts for you. The entire article is available in Horse magazine, which can be found in all good magazine retailers. Dressage has a new format for the Olympics, which you were involved in developing. Are you pleased with the results? Artemis has become more consistent in his performance – what has changed? Richard discusses specific techniques to use if a horse spooks. 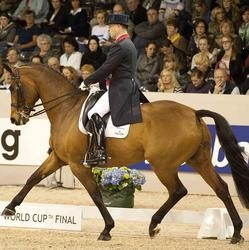 WOW Saddles sponsored Richard Davison (pictured below at the World Cup Final this year), was first of the Brits to go yesterday at the dressage Grand Prix at the Games riding Artemis. A typically polished performance from the experienced campaigners gained score of 72.812 and the biggest cheers we think we have heard throughout the whole of the Games. It even appeared that Richard was fighting back tears afterwards. “Us blokes don’t always show our emotions but it gets harder as you get older,” Richard said…. Well done to you both!! Charlotte Dujardin was last to go for the Brits (and the pressure was on after Laura B’s disappointing score, which left Britain and Germany very close in the team rankings). The pair produced a spectacular, stylish, unhurried and expressive test; the score was a massive 83.663. The action at Greenwich on Friday concluded with Charlotte Dujardin for Britain in first place; Adelinde Cornelissen for the Netherlands in second; Helen Langehanenberg for Germany in third; Kristina Sprehe for Germany in fourth and Carl Hester for Britain in fifth. The team placings are Great Britain in first, followed by Germany, and then the Netherlands. The show jumping started today at the Park, where team GB made a promising start – good luck, boys! Richard Davison has been nominated to the BOA for selection to Team GB by the British Equestrian Federation. 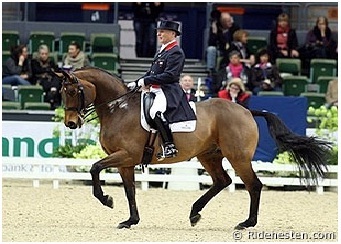 Richard is interviewed post-winning the Grand Prix Special at the World Dressage Masters in Munich in May 2012. The British Olympic Association (BOA) confirmed on Friday, July 22 the four dressage athletes and their horses who will compete for Team GB at the London 2012 Olympic Games. London will be Carl Hester and Richard Davison’s fourth Olympic Games, and Laura Bechtolsheimer’s second after making her Olympic debut in Beijing 2008. While London 2012 will be Charlotte Dujardin’s Olympic debut, she has already made a substantial mark on the international dressage world during her short career to date, with her exciting horse Valegro. Although Great Britain has never won an Olympic dressage medal, a recent improvement in form could buck the trend this summer. Laura Bechtolsheimer, Charlotte Dujardin and Carl Hester were all part of the quartet that won a historic gold medal at the 2011 European Championships, where Hester scooped two individual silver medals and Bechtolsheimer took home a bronze. All four riders boast records to their names. Dujardin recently broke the world and British record in the Grand Prix Special test at Hagen in May, scoring 88.022% and Bechtolsheimer also bettered her own British Grand Prix Freestyle record, scoring an impressive 87.60%. Hester now holds the British record in the Grand Prix test of 83.30%. European medallist Richard Davison is also no stranger to success and has returned to international competition in fighting form in the last couple of years with Artemis, with whom he has scored a number of international wins and placings. The combination finished fifth in the 2012 Reem Acra FEI World Cup. All four athletes compete as individuals, but only three athletes (Bechtolsheimer, Dujardin and Hester) compete as the team for the Games. The dressage competition encompasses the Grand Prix, the Grand Prix Special and the Grand Prix Freestyle – only three athletes from any nation may compete in the Freestyle competition. Reserve athletes and horses will be announced soon. With thanks to The Metro. Our sponsored rider, Richard Davison discusses spooking and napping and how to cope if this does happen. Horses are herd animals. They’re preyed upon, rather than preying on others, unless you count munching on grass. So naturally their instinct is to run when things are looking a little sketchy. After all, none of us want to be eaten by a lion or that gigantic, roaring, hissing beast ever encroaching…a lorry to you and I. These are a number of important horse behaviours to bare in mind when you’re having difficulty out on the roads or hacking. For horses feeling insecure about the environment that they are in, say passing a lorry, tractor or cows, whatever it be, they’ll want to get out of their and they’ll do whatever they can to put distance between them and the danger. We can aid horses in their ability to handle situations with increasing pressure but the solution is long term and a “quick fix” will always be overridden by their innate reactions. So how can we manipulate these innate reactions so as to benefit both us and our horse? Leadership, hark back to the opening sentence. Horses are herd animals and each herd will have a select few of leaders. You’ll need to become your horse’s leader. This does not mean your partnership becomes a dictatorship though, making horses do things is not a long-term solution, as I’ve said before, win-win. Our equine partners can be incredibly trusting of us as riders and it is this that you will aim to build on. Be the provider. Be the one that can feed him, who can water him when he needs it. Their must be respect and reliance from him to you. Thus in a time of need, you will hold the answers. Ground work is the best place to start. Simple things such as leading are often overlooked but are a vital part of their bringing up. A halter or head collar with a lunge line are all you need to start this work. Work on moving him around, forwards, backwards, left and right with the lightest of aids. It is vital that you keep it really simple, why do more when less will be just as, or more efficient and effective. Get the basics nailed in walk with halts and then once you have this base, you can then work up through the different gaits, using the level below as a place of understanding and a “reset button” when things go a little awry. Use voice aids whilst on the lunge as they can be really respond well to this. Remember, it is not necessarily what you say, I’ve yet to teach mine the English language, but rather the tone and way in which you say it. Be consistent in your work, repetition of an exercise being carried out correctly will be what really helps to alter his natural habits. The horse will learn through experimenting. For them, there is no right or wrong, it is key that we do not think of horses as humans. It is us that creates in our mind what is right and wrong. As such we must channel their experimentation so as they keep experimenting until they react in such a way that it achieves our goal. When the begins to head down the road we are looking for, reward him, this will often be with a release of pressure. When he is not on the correct road, keep applying small amounts of pressure up so he keeps experimenting. This does not mean force! Try to spend time with your horse, be clear and positive, gain his loyalty and in return he will respect and look to you for the answers to higher pressure situations. Congratulations to our sponsored rider Richard Davison and his horse Hiscox Artemis who took second place at the final World Cup qualifier in Gothenburg. It was no easy job for the last-man-in, Davison, as the crammed stadium of Swedish spectators were still roaring their approval for their own hero Patrik Kittel as the Brit entered the ring. Gothenburg presents a particularly tough test, as the dressage arena just squeezes inside the confines of the oval-shaped ice-rink, with the four corners touching the surrounding walls. Davison had to call on all his reserves of experience to steer the Countess of Derby and John Dodd’s Hiscox Artemis through their floor-plan, but the 56-year-old rider knows all there is to know about ring-craft and when 75.850 went up on the board he was well in the frame. Kittel’s score, meanwhile, had been swallowed up by the electronic blackout, but it was eventually retrieved and the home crowd rose to their feet with delight during the prize-giving ceremony. Davison said “I had a good time and a great ride” and that it would have been “nice to win in Patrik Kittel fan-land”, but, he joked, “did you notice I did a deliberate mistake for all of Sweden because I didn’t think I’d get out of their alive if I won!” he added.